It is a great pleasure to present the 2015 issue of Going for Growth here in Istanbul, as I did for the past three years on the occasion of the meeting of G20 Finance Ministers and Central Bank Governors in Sidney, Moscow and Mexico. This new issue of Going for Growth comes at a time a return to the pre-crisis growth path remains elusive for a majority of countries. In most advanced countries, potential growth has been revised down. The revision is particularly large in the euro area, but potential growth remains also weak in Japan. And, even if they do better, other advanced countries also share many of the same challenges: slowing productivity, high long-term unemployment and falling labour force participation. Emerging-market economies resisted better during the crisis, but growth has been less impressive in the last year or two. Restoring healthy growth, while ensuring that the gains are broadly shared, requires determined and systematic actions across a broad range of policy areas. In this context, the finding in our report that the pace of reforms has slowed in a majority of advanced economies in the past two years is not terribly encouraging. Fortunately, policy developments in emerging market economies are more positive: the pace of reforms has been accelerating in most major emerging-market countries, reflecting the awareness of bottlenecks and constraints to growth and the need to reduce vulnerability to fluctuations in commodity prices and capital flows. We understand the difficulties many governments in advanced economies face in pushing for reforms in a context of chronic demand shortfalls and limited budgetary leeway. Yet, we see a bigger risk in the slower pace and breadth of reforms. That is of letting a vicious circle develop, whereby weak demand undermines potential growth, which in turn further depresses demand, as both investors and consumers lose confidence. This can lead to persistent stagnation. 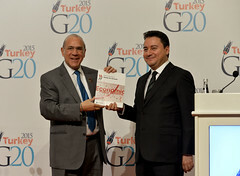 It is also at odds with the ambitious commitments made by advanced economies of the G20 in the context of the Brisbane Action Plan endorsed by Leaders last November: Hence the imperious need to focus on the Implementation of the G20 National Growth Strategies – the OECD therefore strongly supports the first “I”, for “Implementation”, of the G20 Turkish Presidency’s triptych agenda for 2015. Breaking the circle requires the contribution of both macro and structural policies. Structural policies are needed to boost growth in a sustained way. Macro policies are necessary to support demand in the short to medium term. Yet, macro policies still operate under varying constraints across countries. So, it is important that the structural reform agenda also contribute to boosting demand and puts more emphasis on those measures that in addition to boosting productivity and job creation in the medium term can support activity in the near term. Promoting investment, the second “I” of the Turkey’s G20 growth narrative, is clearly one way to achieve this. Efforts to enhance the provision and regulation of infrastructure need to be pursued in both emerging-market and advanced economies. The report also provides a broad set of recommendations to improve firms’ incentives to invest in new market and technologies. Promoting cross-border trade and investment is another way to support global demand while boosting potential growth in individual countries. Progress has been made or is being made through the pursuit of regional trade negotiations and the agreement on trade facilitation. But at the same time, new protectionist measures have crept in and barriers to trade and foreign direct investment continue to hamper growth in both advanced and emerging-market countries. Innovation and global market integration in general are key drivers of productivity gains and should be strongly encouraged. However, measures are also needed to ensure that the gains are broadly shared. Recent OECD work shows that rising inequalities – at their highest in 30 years in OECD countries – are not only undermining the social fabric but also having an adverse impact on growth. Their social and economic consequences call for policy packages that can stimulate growth, reduce income dispersion and promote inclusion. Giving the possibility to develop and adapt skills throughout the working life is fundamental. This starts with good basic education and the need to provide equal access to high-quality schools for all children. In the nearer term, this requires raising the jobs opportunities and earnings potential of low-skilled workers and that young people be given a chance to be in education, training or employment. Reducing labour tax wedges to boost job creation and reforming active labour market policies to help matching workers with jobs are key policy priorities. In many countries, the low labour force participation of women represents a huge potential for growth that can be unlocked with more family-friendly working conditions and better “make-work-pay” policies, including the access to affordable public childcare. This would help achieve one key goal set by G20 leaders, which is to reduce the gap in participation rates between men and women by 25 per cent over the next ten years. In other words, we need to go not only for strong, sustainable and balanced growth but also for a more inclusive type of growth – which is precisely the third “I” – for inclusiveness – of the Turkish G20 Presidency. Turning to our host country, Turkey’s commitment to a package of 25 “structural transformation programmes” is a promising example of a broad approach to reforms. The envisaged measures to promote technological skills, to foster flexicurity in labour markets and to raise women’s participation in economic life will boost private sector confidence and investment, and lift potential growth. With this, let me conclude by highlighting the importance of having reform strategies that are sufficiently comprehensive to create synergies across policy areas but also across countries. Providing clear guidance about the direction and sustainability of policy decisions is fundamental to give the needed confidence about growth prospects. The discussions taking place here today and tomorrow are very important to ensure a successful implementation of the Action Plan agreed by leaders in Brisbane and the achievement of the 2 per cent upside growth objective by 2018. Going for Growth contributes to this objective by helping governments, in the G20 and beyond, to push ahead with their national growth strategies.